There are three Fireless locos plinthed in the Strand / Somerset West areas. This page refers to AECI #1 0-4-0F Borsig 1909. Blog pages also exist for AECI #2 0-4-0F Borsig 1912 and AECI #3 0-4-0F Borsig 1932. All of these fireless steam locomotives were used by AECI Ltd (formerly African Explosives & Chemical Industries) at their former Firgrove explosives factory near Somerset West. The factory had exchange sidings at the end of a 3km SAR branch south east of Firgrove on the SAR Cape Town - Somerset West line. Explosives production ceased during 1989 and by 1991 the only traffic then was chemicals and fertilizers from AECI Ltd and Kynoch Fertilizer Ltd whose works were adjacent to AECI. 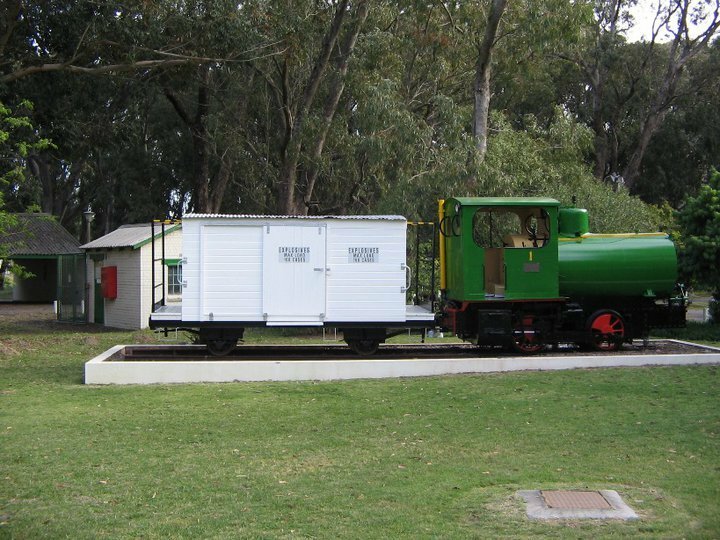 This photo by Dylan Knott shows the locomotive and explosives truck in a former position at the entrance gate - it has since been removed to be re-plinthed at a different position. Nigel Randall gave us (in the sar-L list) an interesting snippet about the fireless locos at AECI: "Fireless locomotives were used very successfully by AECI at its Somerset West Explosives Plant where I was employed in the early 60's in their loco shed. The risk of spark creation when dealing with big bang material was the attraction. Maintenance on these units consisted mainly of brake block replacement which for some reason seemed very excessive. The only major incidence we had with these locos was when a driver on one night shift either failed to apply brakes when entering the recharge shed or had a mechanical failure as he ended up travelling through the stops breaking down the boiler room wall, destroying the steam connection and repositioning the boiler somewhat. Funny I never saw him at the plant again.! But we did spend a great deal of time getting it back on track and carrying out repairs." This type of locomotive was very desirable for service in plants where cleanliness and the elimination of fire hazards and noise were important. They were quite popular in applications where smoke and cinders could ruin the product, as in textile mills or agricultural processing plants. In those applications where this type of locomotive fits, it was a reliable and economical unit of motive power. Fireless steam locomotives could be found working in chemical industries, powder plants, paper mills, food plants and electric power plants, wherever a reliable source of steam was readily available. All of these pictures were taken on 15 October 2008. The fireless steam locomotive is one of the most remarkable and foolproof locomotive designs devised. A locomotive equipped with a large tank or reservoir instead of a boiler and firebox, it carries no fire. This engine was essentially a giant thermos bottle lying on its side with wheels. In 1991 AECI #1 0-4-0F Borsig built in 1909, boiler number 42489, works number 7364, was preserved on a plinth outside the Main Gate. However, by 2008 a property development project at the Main Gate was in progress, and the locomotive had been relocated to a temporary position inside the AECI fence - I asked the security guards for access. It is to be hoped that the locomotive will be re-plinthed again soon at a suitable position. The reservoir/tank stores heat in the form of hot water and steam. Steam is charged into the reservoir via a charging connection valve and a perforated pipe so that temperature of the entire body be gradually raised. The time required to take on a full charge can vary from 10 to 30 minutes, depending on the charging pressure, the size of the reservoir, and how low the charge was before being refilled. When the reservoir is fully charged, 85 percent or more of its volume is filled with hot water and the remainder with steam. As steam is drawn off and used in the cylinders, pressure in the reservoir drops and some of the hot water flashes into steam. This newly created steam draws its heat of vaporization from the hot water which remains in the liquid state and, as a result of the vaporization; the temperature of that water is reduced. This continues until the temperature of the water drops to the point below which it will no longer vaporize into steam at sufficient pressure to be used in the cylinders. The cylinder proportions are such, however, that the locomotive can move itself on very much less than the normal working pressure. European fireless steam locomotives usually have the cylinders at the back (like a Cab Forward engine), while American ones often have the cylinders at the front, as in a conventional locomotive. In a fireless steam locomotive, in place of a boiler, the locomotive is fitted with a cylindrical tank which is charged with steam and hot water from a stationary plant. As a rule, but little equipment must be installed for their operation, as the majority of industrial plants are supplied with the boiler capacity necessary for charging the locomotives. The reservoir contains only a few working parts, these include the charging pipe, check valve, throttle and throttle rod, and dry pipe. The storage pressure usually approximates the working pressure of a locomotive boiler; but the pressure of the steam is considerably reduced before it enters the cylinders. These locomotives are simple in construction and, as they cannot explode, they are exceedingly safe to handle. Note the steam exhaust pipe. Normally, one charging, or one full plus several partial chargings, will keep a fireless locomotive at work for a full day. Steam for charging may be obtained from any available source, such as the plant’s steam supply, and is delivered to the locomotive reservoir through a flexible charging connection. One centrally located charging connection is usually sufficient, but where the locomotive operates over a large area more than one charging station may be desirable from the standpoint of convenience and economy. In 2004 the locomotive was completely refurbished and dynamite wagon was added to the loco. In some unknown recording system, this was "pressure vessel" number 127, locomotive #3 carries the number 129, presumably locomotive #2 would be number 128. This plate shows that the engine was re-boilered and that a boiler test was done on 22 Jan 1931. Engine number #3 was also re-boilered in 1932. Technically the locomotive was re-vesselled, not re-boilered as it does not have a conventional boiler. (Johann Friedrich) August Borsig was the founder of one of Germany`s principal engineering companies. He was born, the son of a carpenter in Breslau (Wroclaw) in Silesia, and studied building for a time before embarking on a commercial education in Berlin, which led him towards engineering. By 1872 Borsig was the largest producer of locomotives in Europe, with works at Zabrze in Silesia and at Dortmund, as well as those in Berlin. It entered a period of relative decline after the death of August Borsig`s son Albert in 1878, and went through many mergers in the 20th century. It continued nevertheless to produce notable locomotives, including the three class 05 streamlined 4-6-4s of 1935-37, which set various speed records. One of them is preserved at Nuremberg. The last of 16,352 steam locomotives produced by Borsig was completed in 1954. Prior to recharge, the combination boiler/water tank would be 80 percent filled with water. It would then be connected to an external steam line, which would heat the water in the tank to temperatures of 400º F, with internal tank pressures rising up to 400 psi .The cylinders would operate at pressures of 150 psi. After a recharge, the steam heater line was disconnected and the driver would open the throttle, resulting in the sudden generation of “flash steam” inside the boiler/water tank, as a slight pressure drop occurred. Like its counterpart which carried an on-board firebox, the fireless too required the occasional reservoir washdown to remove scale. This could be minimized or eliminated with the use of distilled water. Another way this cost can be reduced and efficiency can be improved is by switching from an open system of exhausting waste steam and refilling the water storage tank, to a closed system which recycles the water. The cylinder proportions are such that the locomotive can move itself on very much less than the normal working pressure. The locomotive and truck are not properly plinthed. All three are still in existence plinthed in the Somerwet West/Strand area. Apart from the 9 Fireless (6 by Henschel and 3 by Porter) at ISCOR (of which several have been preserved at FOR and SANRASM), there were also Fireless locos in Natal at Masonite in Estcourt, both of which got scrapped although still working into the 1980's. ESCOM had several Fireless locos including 0-4-0F, 0-6-0F and a couple of huge Andrew Barclay built 0-8-0F at Congella in Durban, one of which is now at SANRASM and the other at USR. Two others ex ESCOM Colenso are preserved by the road in Colenso town.